1. 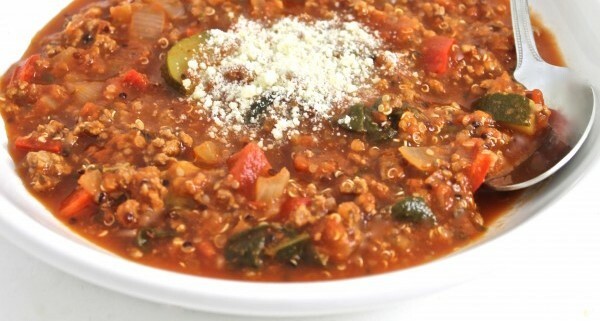 Cook quiona: In a small pot, add ½ cup quinoa and stir in 1 cup water. Bring to a boil, then turn down to simmer, cover and cook on low heat, until all water is absorbed, about 12-15 minutes. 2. In a large nonstick pot, add ground beef, onions and garlic. Brown beef throughly, stirring often and breaking up beef into very small pieces. Once browned, pour into a colander in the sink, to drain the fat. 3. Add beef and onions back to pot. Stir in tomatoes, pasta sauce, beef broth, zucchini, mushrooms, red bell peppers, red pepper flakes, Italian seasonings and black pepper. Mix well. Bring to a boil, turn down to simmer, cover, and cook 25 minutes. Remove cover, stir in spinach and cooked quinoa. Mix well. Cook 2 more minutes, until spinach is wilted. 4. This soup freezes great!